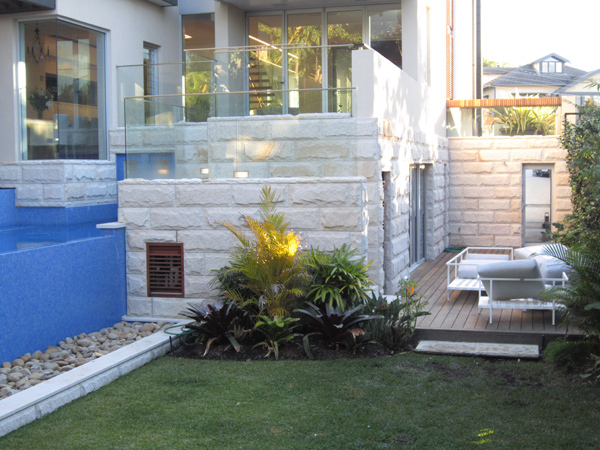 Stone cladding products are fast becoming the new wave of masonry. Used where traditional block does not allow or budget does not provide for. Widely regarded as the material of choice in Sydney, Sandstone was used to envelope the first storey of this residence in Vaucluse. Due to the weight of individual pieces of sandstone and a timeframe of 8 weeks, we opted for a modern mechanical fixing method known as Stoneclip, where by each piece of sandstone is fixed to the substrate and supported by its own weight without the need for glue. The sandstone feature wall in the stair well extends all 3 storeys of the house. Appearing as a solid sandstone wall, this 50mm thick rockfaced cladding was installed using the unique stoneclip method. Sandstone cladding was used extensively to envelope the first storey, combining modern techniques with the heritage of one of Sydney’s oldest suburbs.